A website for your business is no longer a luxury. It’s a necessity. But, just because you invested in a website doesn’t mean that it’s effective in connecting with your customers and ultimately improving your sales. 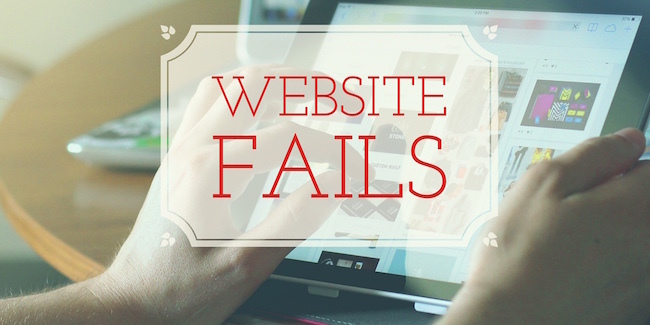 While there could be numerous reasons why your website isn’t effective, here are 10 of the most common explanations for website fails. Unfortunately, there are still lots of websites that aren’t mobile-friendly. This is just bad for business since it can lead to penalties from the Big G, decrease conversation rates, and deliver your customers a poor experience. To make sure that your site is ready for mobile users, make sure that you use a responsive design, have large buttons and due you due-diligence on a/b testing, keep your layout simple, and again, test it using tools like Google’s Search Console Mobile Friendly Test. Hours, pricing, and an “about us” page. 5. Your website loads too slowly. Customers expect a website to load quickly. In fact, 47% of consumers expect a website to load in just 2 seconds or less. And, that’s important to remember because an astounding 79 percent of shoppers who don’t enjoy their website experience less likely to ever return to that site again, nor buy from that site again. Believe it or not, that are still businesses that insist on having websites that have music or videos play automatically once your enter the site. Even worse, these sites are also full of banner ads, bright colors, and flashy text. These sites are just plain annoying and end-up slowing the page down because it’s so cluttered.